Free portable colour picker and colour editor for web designers and digital artists. While taking part in any computer routine, graphic designers, digital artists and web-designers may see colours and colour combinations they would like to use in their projects. With Just Color Picker, identifying the colours, saving, editing and combining them into beautiful colour combinations is a quick and simple job. One of the main advantages of Just Color Picker is that it was created by a person who uses it on an everyday basis. It is software for designers and digital artists created by a designer and digital artist. Most widely-used formats of colour codes: HTML, RGB, HEX, HSB/HSV, HSL, HWB, CMY, CMYK and Delphi. Averaged colour sampling for easy handling of colour noise. 3x, 9x and 15x magnifier and keyboard control of the mouse cursor movements for greater precision. Screen freeze feature for sampling the colour of the elements that change on mouse-hover. Calculation of the pixel distance between points. Colour list for saving and re-using the picked colour samples. 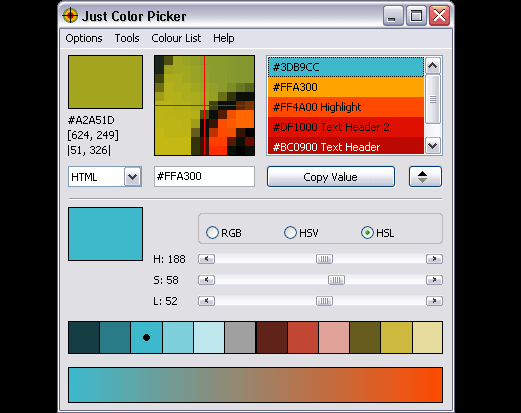 The ability to open, edit and save Adobe Photoshop .aco colour swatches (Adobe color files) and GIMP .gpl palette files. Interaction with the standard Windows or macOS colour dialog. User comments and notes for any picked colour. Conversion of HTML/Hexadecimal and RGB colour codes into the corresponding colours. Red-Green-Blue (RGB), Cyan-Magenta-Yellow (CMY) and Red-Yellow-Blue (RYB) colour wheels with marked triads and complementary colours. RGB, HSV and HSL colour editors for adjusting and editing colours. Gradient transition between any two colours for creating a wide range of in-between hues. Text tool for evaluating the readability of the selected font and background colour combinations. Copying the colour code to the clipboard with one mouse click or automatically. No installation required. Just Color Picker is a portable application and can be run directly from a USB stick. Supported platforms: Windows 2000, Windows XP 32 bit &amp; 64 bit, Windows Server 2003, Windows Vista 32 bit &amp; 64 bit, Windows Server 2008, Windows 7 32 bit &amp; 64 bit, Windows 8 32 bit &amp; 64 bit, Windows 10 32 bit &amp; 64 bit; macOS X 10.6.6 or later. High-DPI aware application. Portable software, no installation required. Latest version: 5.2, released 22 January 2019. What’s new in version 5.2: added CMY format, improved input check for code-to-colour conversion, upgraded macOS file from 32 to 64 bit. 187 373 Anny Studio <img src="https://www.oldergeeks.com/downloads/gallery/thumbs/justcolorpicker1_th.png"border="0"> Jan 22, 2019 - 12:42 5.2 2.06MB DMG , out of 1 Votes.